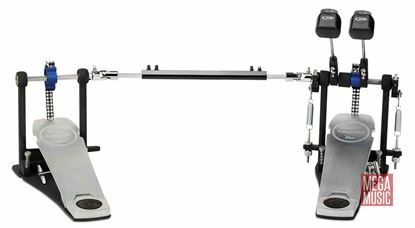 Direct drive bass drum pedal experience, check it out! Double cam power and accuracy. Get racing with the 400 Series double kick pedal from PDP. The PowerShifter Eliminator gets 'redlined' for a top performance double kick pedal. Get personal. Patented interchangeable cam system makes the Eliminator a stand-out kick pedal from the crowd. Add double pedals to your existing single pedal. Combining the features of the Demon Drive with a chain drive for feel and power.